The complexity and diversity of projects have increased at a rate few would have predicted just 20 years ago. Now, a major limiting factor in project success is the competency of those charged with managing those projects. Tools, techniques and processes can only take you so far before it comes back down to experience, professional judgment, competency and confidence. We have spent many years re-thinking how we manage projects, now we need to re-think how we manage the project professionals that manage them. Adult learning is, essentially, based on social constructs. We talk, we observe, we engage with groups both socially and in the workplace and we develop behaviors that reflect that interaction. Why then, when we think of education, particularly Higher Education, do we always think of a classroom, with a lecturer in front of a white board, using fixed format presentations? Much of our preconceived ideas of education hold true to a certain level. Tertiary education is about learning new ideas and concepts. Undergraduate education is about building on those ideas and learning and understanding new and emerging theoretical constructs. But at postgraduate level it is not so much about learning new things, it’s more about making sense of those things in a contextual situation. Now move to the next level, the emergence of post-experience postgraduate education. Business Schools around the world have successfully developed and run the MBA for a business community that sought to develop ‘core business’ skills for an ever-changing world. Much criticism has been levied though in their failure to teach the ‘practice’ of actually managing. It is relatively easy to teach the analytical and theoretical concepts that underpin an MBA syllabus, but the ability to teach practice is a whole different ball game. Indeed, many argued that practice couldn’t actually be taught at all. It can be experienced, it can be observed but in the end it is something that the student must undertake, perhaps with guidance or coaching, but certainly on a personal basis. Developing ‘practice’ was seen as a very solitary educational experience in the main, until some forward thinking pedagogic thinkers starting to think what ‘practice’ represented. The world of professional development is starting to finally come of age. In 1999, what was then UMIST (now University of Manchester) was approached by Rolls-Royce with a notion of developing a practice focused MSc in Project Management, where working professionals could develop, learn and work in a seamless fashion, and at the same time engage with others from different organizations and different tiers of the supply chain, so appreciating the importance of context in the learning process. Uniquely in the HE world, the course was developed in conjunction with its stakeholders, not primarily the academics who delivered it. The content met not only the requirements of the APM BoK at the time (fourth edition), but also incorporated the emerging challenges identified by the Subject Matter Experts (SME’s) who worked on each Module development. The University was a stakeholder in the development and delivery so breaking the traditional teacher / learner divides. The delivery process is monitored by a steering group, of which the University is one stakeholder, which reviews performance and advises on changes if they are required. So, finally, true professional development was coming of age. 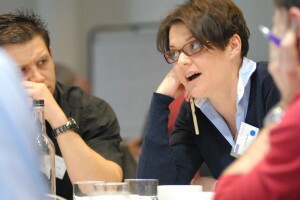 The Project management professional Development Programme (PMPDP) has now, 15 years later graduated over 350 professional with MSc, but also through its ladder of opportunity has allowed many others to take a single module as part of CPD, or four modules leading to a post graduate certificate. The one thing that all delegates share though is the PMPDP experience. The bringing together of like-minded professionals to learn not only from the course content, but also more importantly, from each other. Most of us are familiar with the idea of a ‘Community of Practice’. Many of us will have participated at some point in one or more, and perhaps have become frustrated that we seem to talk about the same things for much of the time. Indeed there has been much research that identifies a failure of many CoP activities is down to the fact that they often fail to generate new lines of inquiry, or gain new perspective of the same issues. Universities are often perceived as ‘Communities of Learning’ (CoL). We identified early on in the PMPDP development that the traditional perception of a community of practice being focused predominantly on practice and a community of learning being based on learning, was a limiting factor. It was important that delegates focused not just on the ‘what’ but also on the ‘why’. We saw PMPDP as being the overlap, the space in time that allowed practitioners to wear both practitioner and student hats, and look at things from different perspectives, but more importantly be able to share those thoughts with a group of others who came from very different backgrounds and industries (see Fig 1). Indeed, we identified that one of our strongest assets were our delegates themselves. They as stakeholders not only participated in the program, they were joint owners of the program. In 2011, we embarked on a new project. One of the things we needed to strengthen was our link with the graduate community from PMPDP. Whilst we were focused on the current crop of delegates being a large stakeholder community, we had nearly 300 graduates, many of whom were eager to play a part in the future of the course. They represented several thousand years worth of context-based experience collectively, and this was too valuable not to capture to some degree. Moreover, they had been through the course, and knew better than anyone how to manage the thinking process from theory into practice. They had learned, maybe late on in their studies, how important reflective practice was to their own professional development. Up to that point reflective practice formed a big part of the dissertation phase of the course, but we needed to front end load that part of the course instead of ramping it up later. So, in 2011 we bid for and won pump-priming money from the Faculty of Engineering and Physical Science (EPS) to pilot what became the Project Management Peer Assisted Learning (PM-PAL) group. Initially we selected 6 graduates to assist in the delivery of the course to our new intake, and appointed them as visiting lecturers. We knew from research that many of our delegates took three or four modules before the link between theory and new ideas and contextual practice became a natural thinking process. We knew that we had to move that awareness moment much earlier into the delivery, and this would only happen if delegates were subjected to a greater focus of contextual awareness. The role of PM-PAL was to work in small groups, looking at case materials with the latest crop of delegates and discuss how they could make sense of PM problems by reflecting on their own experiences, no matter how limited. They could also show how to evaluate new ideas in the context of their own work environment, and critique them effectively. Not falling at the first hurdle of ‘it will never work in my company’ but moving forward to ‘what barriers exist currently that might prohibit it from being successful’. But most importantly, I was keen that they fostered the notion that there were no right and wrong answers, only the most appropriate answer. It was about understanding the context, the environment, the stakeholders, the product, the contract and so on that made the difference. In effect, the solution would be contextually relevant. The pilot was a great success, and to date we have evolved that session with the new intake into a more focused and integral part of the delivery. We have just received additional EPS funding that will allow us to expand the PM-PAL group and have them capture their collective contextual experiences in the form of case studies and vignettes. These will be delivered with all modules in the future with all delegates both new and old. Some 15 years ago we set out to challenge the existing model of postgraduate education and develop a new culture of Professional Development Programme (PDP). We are still learning, but we have already used the experiences from PMPDP to develop a similar programme for engineers and technical managers in the nuclear sector. The one message that is clear and is part of our DNA, is that context is king!